One law for them…: This image appeared on Twitter, summarising how the law treats MPs in comparison with the rest of us. 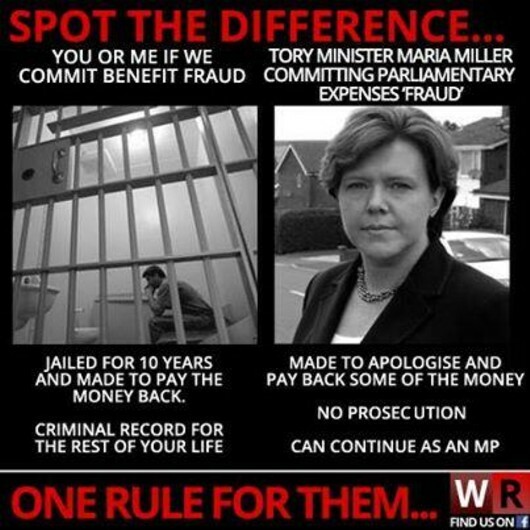 Fraudster – and Minister for Equalities – Maria Miller has been ordered to repay £5,800 and apologise to Parliament after an inquiry found she had over-claimed mortgage expenses. In essence, she made fraudulent expenses claims that were not reduced to accommodate a fall in interest rates. The Parliamentary Commissioner for Standards launched an investigation into her behaviour after it was reported that, between 2005 and 2009, she had claimed £90,718 in Parliamentary expenses for the mortgage and upkeep of a south London house that was occupied, not by Mrs Miller, but by her parents. The Commons Committee on Standards did what’s usually expected and cleared Miller of the central charge – deliberately submitting expenses claims to which she was not entitled. 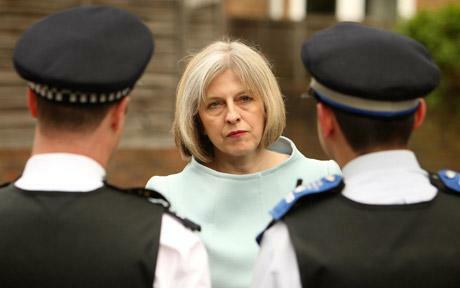 Instead, she is being penalised because her attitude to the inquiry breached the ministers’ code of conduct. The committee rejected the charge that she or her parents had benefited financially from the arrangement. That’s very interesting, considering that Miller recently sold the south London house at the centre of the affair, making a profit of £1 million (according to the Daily Telegraph). John Mann MP, whose complaint led to the inquiry being launched, has been tweeting on the subject. He says: “Miller forced to apologise for showing ‘completely inappropriate attitude to the inquiry’. Doesn’t take it seriously. Mr Mann’s own article about it can be found here. 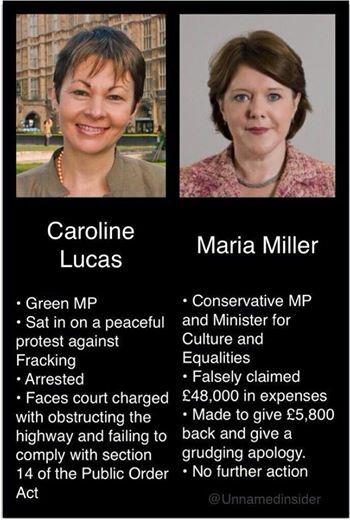 If Miller had been arrested and put on crown court trial for fraud (as seems likely, considering the “legalistic” way she tried to defend herself against the Parliamentary commissioner’s inquiries), she could have been imprisoned for up to 10 years. That is what happens to other people. But Parliament looks after its own. The e-petition calling for the office of the Parliamentary Standards Commissioner to be replaced has been rejected by the government website. Help me out here, folks. I can’t see how this matter can be outside the responsibility of the government, since it is the House of Commons that oversees the office and appoints commissioners. There’s no party political material. There are no commercial endorsements. Clearly it’s not something handled by a devolved body or personal correspondence, nor does it make an FOI request. There is no attempt to explain the matter further and no email address through which to discuss the matter. All I can imagine is that they interpreted the link to this blogsite as a commercial endorsement. Perhaps if I remove it? I would appreciate input, especially from anyone with experience of the government e-petitions site. Oily Osborne has slithered away from any chance of a fraud investigation by the standards commissioner, but he will have to live with the allegation for the rest of his career. I believe I am one of many who received an email from the office of the Parliamentary Commissioner for Standards yesterday, turning down the call for an inquiry into possible expenses fraud by the Chancellor of the Exchequer. Mine continued: “I am afraid I am unable to say what the police meant by their comments,” referring to my complaint to the Metropolitan Police and the strange response that it was being investigated elsewhere. My first reaction was: How much evidence does the commissioner need? If he’s a villain, he’s hardly likely to sign a confession! We know Osborne claimed against his mortgage on the property in Cheshire and we know that the mortgage was for three land titles, not one. Therefore we deduce that he claimed money for Parliamentary duties taking place on at least two pieces of land where such duties could never have taken place, and the prima facie evidence (as the police would say) suggests further investigation is required. Do we even have proof that Osborne ever actually used the Cheshire farmhouse to carry out Parliamentary duties? Whenever I have claimed expenses for a job, I have always had to produce proof of it. How has he used that house? When did he use that house? Where is the proof? If he met constituents, my understanding is that he used the Conservative office in the same building as the local Conservative Club (which is to close through lack of funding; interesting that Osborne is making out like a bandit while his local party suffers). Could he have travelled up from London, held those meetings, and travelled back within the same day? If so, then the farmhouse and the two pieces of land are now looking increasingly like long-term investments, maintained at cost to the taxpayer, that were to be sold at a later date for huge profit (as, in fact, they were). Second reaction was: If the Parliamentary Standards Commissioner cannot investigate an open-and-shut fraud case (which is what this is) then what is the point of the office as it currently stands? On balance, it seems likely that Members of Parliament can continue to commit abuses of public money – and trust – and get away, free as a bird, in the current system. Therefore, with this decision it seems the commissioner, who only took up the post this month, is attempting a tacit resignation from it. Let’s have a standards watchdog that actually investigates and prevents abuses, shall we? Maybe I’ll start an e-petition. Third reaction was: Without a full and frank investigation, Osborne will always stand accused of expenses fraud and of abusing the trust placed in him as a member of Parliament. So, in fact, the commissioner has done him a great disservice. Mud always sticks, as the old saying goes. There’s no smoke without fire. 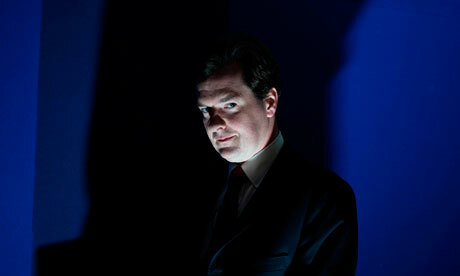 There’s no stink without a stinker, and in this case the odour can emanate from nobody else but Osborne. He’ll never be able to live it down. And he’ll never be able to say that nobody raised the issue, because we have. Osborne update – are they kicking his paddock into the long grass? Is the Parliamentary Commissioner for Standards going to let Osborne get away with using taxpayers’ money in a get-rich-quick property scheme, and then pocketing the profits? Only you can make him think again. It seems clear that if he committed fraud he should be jailed. Efforts to find out exactly why George Osborne was allowed to make up to £1 million by using taxpayers’ money to pay mortgage interest on three properties in Cheshire, while fraudulently claiming he needed it to pay expenses for his use of just one of them for Parliamentary duties, appear to have run into difficulty. “Thank you for your letter… to the Parliamentary Commissioner for Standards. I have been asked to reply. “I hope it will be helpful if I explain the role of the Parliamentary Commissioner for Standards. The Commissioner is able to inquire into complaints of a breach of both the Code of Conduct and the rules of the House only if they are supported by sufficient evidence to justify an inquiry. That’s not good enough, is it? It makes no mention of what the commissioner is doing about the complaint and merely runs over ground that has been covered already, via email. “Thank you for your letter… regarding my complaint. “I notice that you do not mention anywhere in your reply whether the commissioner is going to investigate this matter or not. However you do, helpfully, state that the commissioner is able to inquire into complaints of a breach “if they are supported by sufficient evidence to justify an inquiry”. “You will know that a previous inquiry was made into the status of Mr Osborne’s former property in Cheshire after concern was raised about his claim for expenses regarding Parliamentary duties he allegedly carried out at a house there. “This is a separate complaint. “As you will know from my previous letter, Mr Osborne claimed expenses, not only for the house but for two other land titles which were also part of his mortgage. These pieces of land could not have anything to do with his Parliamentary business and yet his claim included them. Therefore, his claim was fraudulent – he was stating that it was for one thing – Parliamentary duties – when in fact it was for another – to pay off, at the taxpayers’ expense, a mortgage he had taken out for a considerable amount of money. We have subsequently discovered that Mr Osborne has sold all three properties for an amount that could be more than double the price he originally paid for them – up to £1 million – and kept the entire amount. I have provided ample evidence to support the above statements. “This is a scandalous matter. 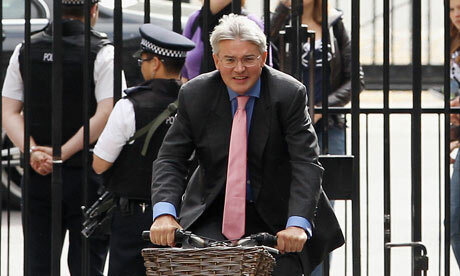 A member of the Cabinet – the Chancellor of the Exchequer, no less! – diverting taxpayers’ money under false pretences in order to gain a pecuniary advantage of up to £1 million. And at a time when millions of people are having to make the choice between staying warm and eating! “It may interest you to know that many right-thinking citizens of the UK are also scandalised by this matter and wish to see it resolved and justice done. Articles I have written have attracted the support of around 5,000 readers and they all want to know what will be done about this. I appreciate that, in the context of a nation of 60 million people, 5,000 is not a great number. However you should bear in mind that I occupy only a very small corner of the UK’s media. If my platform had been more high-profile, you can be assured that many more people would be calling for justice in this matter. “You also refer to the fact that I have reported this matter to the police. This is true. But I must inform you that I received a strange telephone call from the Metropolitan Police, stating that they could not investigate the matter directly as an investigation was already in progress, being handled by others. They declined to explain what they meant. Can you tell me what they meant? I wrote to my MP, seeking clarification, but he has not yet responded. “Taken as a whole, and writing as a right-thinking person myself, I have to wonder whether attempts are being made to obscure this matter – cover it up, hide it away. Your letter is a case in point. Why do you not tell me outright what the commissioner has decided? Does anyone feel like supporting this complaint? Just email standardscommissioner@parliament.uk and say you are aware a complaint has been made about George Osborne’s expenses claims for the property in Cheshire he recently sold, and that you wish to know when the inquiry will be set up and how matters are progressing. If enough people shout about it, maybe they’ll shift. He thinks he can get away with using taxpayers’ money in a get-rich-quick property scheme, and then pocketing the profits. It seems clear that he committed fraud. He should be jailed. Thank you for your email of December 20, and for replying to my complaint about Rt Hon George Osborne MP so promptly. Herewith please find copies of Land Registry documents relating to the properties in question. These may be obtained from the Land Registry on request. It is clear from them that both properties were owned by Mr Osborne and were sold together – as a single transaction – to the new owners. Under those circumstances it is unreasonable to expect that the valuation of £445,000, which appears on both documents for the period when Mr Osborne owned those properties, relates to those properties individually; it is the value of both properties, taken together. That is how Mr Osborne bought them, and it is how he sold them. It is unreasonable to expect anyone to believe there are separate valuations for the land and the building. It must follow, therefore, that Mr Osborne’s claim for mortgage expenses towards use of the building in the pursuance of his Parliamentary duties also went towards payment of mortgage expenses on the paddock, and I understand it is now a belief that is widely held by the public, that Mr Osborne did not spend a single penny of his own money on the mortgage for the properties in question. There are questions that I cannot answer for you. I do not hold details of the single mortgage he held, that covered both the land west of Macclesfield Road (the paddock) and at Harrop Fold Farm – that would be a private document and its details would be a matter for him to divulge. Therefore I cannot say for certain whether he claimed for all of the mortgage interest or just a percentage covering the house. As a reasonable man, however, I can say that it seems unlikely he would put forward an arbitrary figure – and how would he know the correct valuation for the building alone, when he bought it and the paddock as a single package? You rightly state that the Commissioner has already inquired into Mr Osborne’s claims for his second home over the relevant period. The only conclusion I can draw from this, in the light of the above information, is that Mr Osborne may have misled the Commissioner about the true nature of his mortgage interest payments. I would imagine this is a serious offence against the Commissioner’s office; if it is not, I am sure that the general public would be as shocked as I would. Bear in mind also that the sum of money concerned in this affair is around £1 million. This is not a paltry amount and, if the taxpayers of the UK have been unwittingly subsidising a profit-making scheme for this man, it would be unreasonable to deny them knowledge of the matter and recompense for the misuse of their tax pounds. Thank you for your attention in this matter. I look forward to receiving your response. I understand that your office would not, in any case, proceed with an investigation without a written complaint, so I will put the necessary documents in the post at my earliest convenience.